There is a lot of scaremongering out there about the PAYE Moderisation starting 1st Jan 2019 (no phase in period), and if you are planning on doing nothing, then yes be scared. Revenue are not messing around with this, and there’s a 4,000 euro fine for messing up. Per incident! We told you about this back in May, and we promised we would be back so here we are. What we’re hoping to do is give you bite sized chunks of work so as not to overwhelm and to ensure you get this right first pay period 2019. ROS has a list of who it thinks are your employees. It is your responsibility to make sure this is correct, by the October 31st deadline. Click the video to the right to see an example of using ROS to review your employee list. Fix erroneous information such as addresses and PPS numbers. Remove employees no longer with you, add any employees you have who are not listed. There are two ways to do this, either through ROS only, or by using your payroll software. Follow this link to see how to do it on ROS by downloading a file, adjusting it, and uploading it again. The ROS people are very helpful if you get stuck. If you already have payroll software, consult their help to see how to accomplish this. If you are new to payroll software, we are recommending Cloudpay Online Payroll Software. We like it because it is online and it will integrate with SortMyBooks. 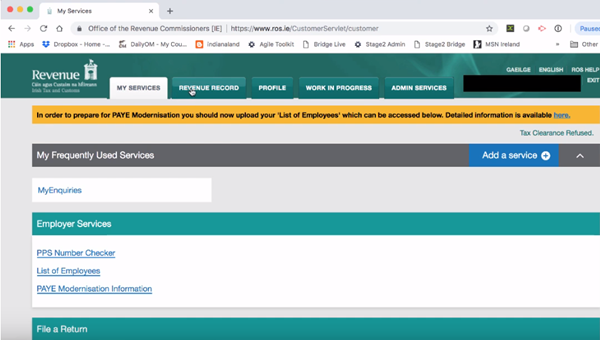 Click the video to the right to see how to comply with the October 31st employee list deadline using Cloudpay Online Software. Whether you are using Cloudpay Software or uploading to the Revenue yourself, you MUST be registered with ROS, so now’s the time! Click the video to the right showing you how to register. This is prepared by the ROS people, they are very helpfiul. Can I not carry on as normal? So I’m thinking that’s a hard no. I currently outsource my Payroll function – does this apply to me? Ask them for the list of employees they currently have listed as being in your employ. Validate that list, let them know to issue a p45 to anyone that should no longer be on that list. Give them the name, address and PPS number of any employee that you have been paying that is not on their list. Agree an exchange of information about your payroll details from now on. Get their help cleaning up any employees that you’re paying on a net pay basis. Click here for more information on this. Full disclosure there’s some giving out on this sheet. We will be back to show you next steps, how to prepare for your first payroll run of 2019. Very important – If you are currently outsourcing your payroll function, have a chat with your provider about fees for 2019. Note: There are only 5 spots left for our third option, the 1 to 1 training. Remaining dates are: December 3,4,5,12,13. So the bottom line is, don’t panic, but do take action!